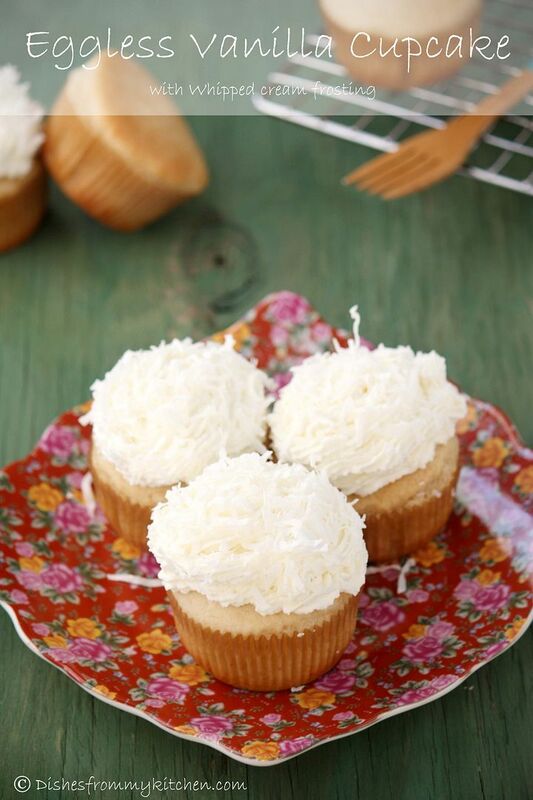 Dishesfrommykitchen: BEST EVER EGGLESS VANILLA CAKE/CUPCAKE ! 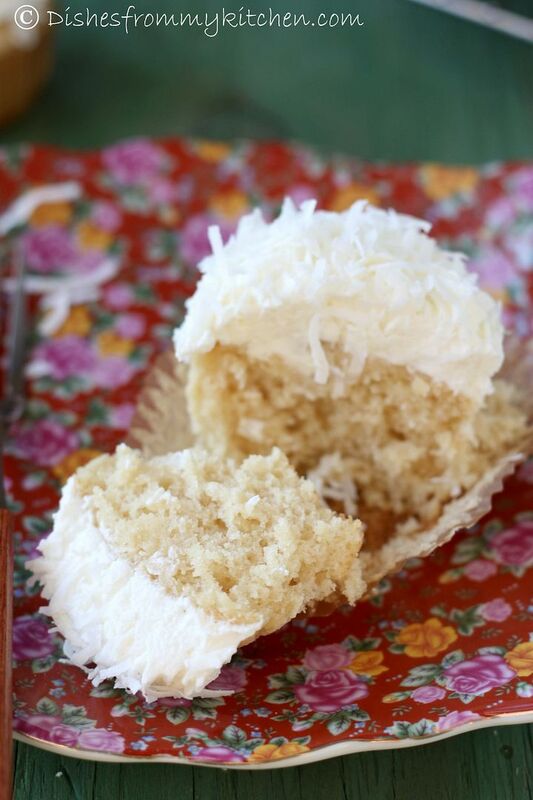 BEST EVER EGGLESS VANILLA CAKE/CUPCAKE ! 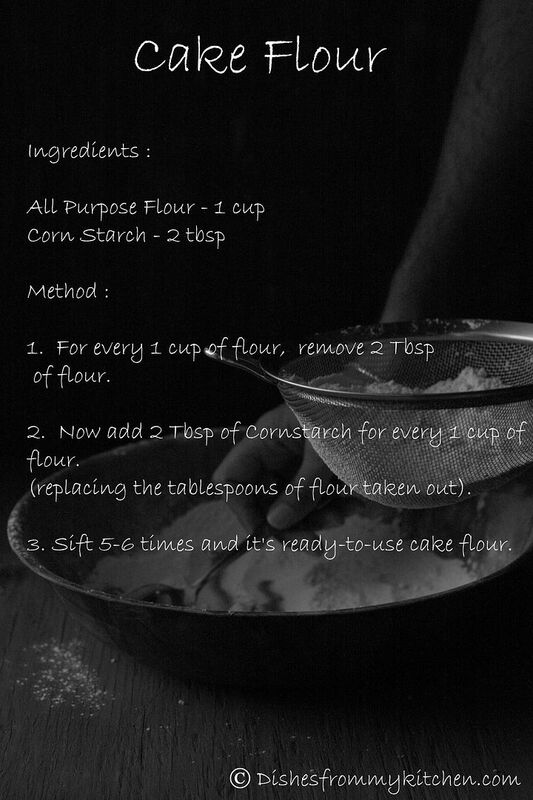 How to make Cake Flour?? 1. For every 1 cup of flour remove 2 Tbsp of flour. 2. Now add 2 Tbsp of Cornflour for every 1 cup of flour. (Replacing the tablespoons of flour taken out). 3. Sift 5-6 times and it's ready-to-use cake flour. You can do this cake flour for 2 or 3 cups and store it in the air tight container. Use the amount that is recommended in the recipe. This recipe yields 5 to 6 cupcake. See the note for Variations and for vegan substitute. You can also substitute Milk and Vinegar with 1/2 cup Yogurt as well. 1. 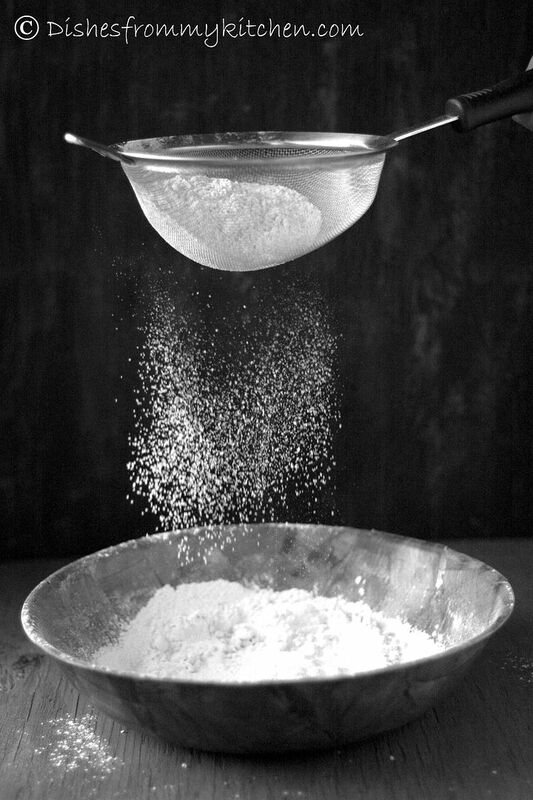 In a large bowl sift together the flour, baking powder, baking soda and salt. Mix in the sugar. 2. In a small bowl add milk and vinegar mix them and keep it aside for a minute. (If you are using Yogurt use them instead of milk and vinegar) In the same bowl mix other wet ingredients and give it a whisk. 3. Now make a well in the center of the dry ingredients and stir in the wet ingredients. 4. 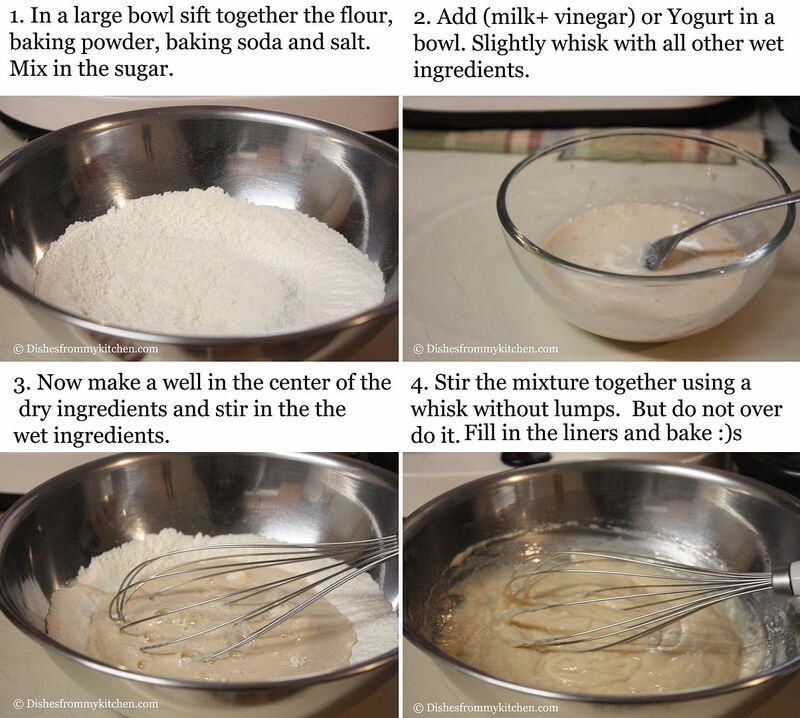 Stir the mixture together using a whisk without lumps. But do not over do it. 5. Fill the cupcake liners about 2/3rd full with batter. Preheat the oven to 350 f.
6. 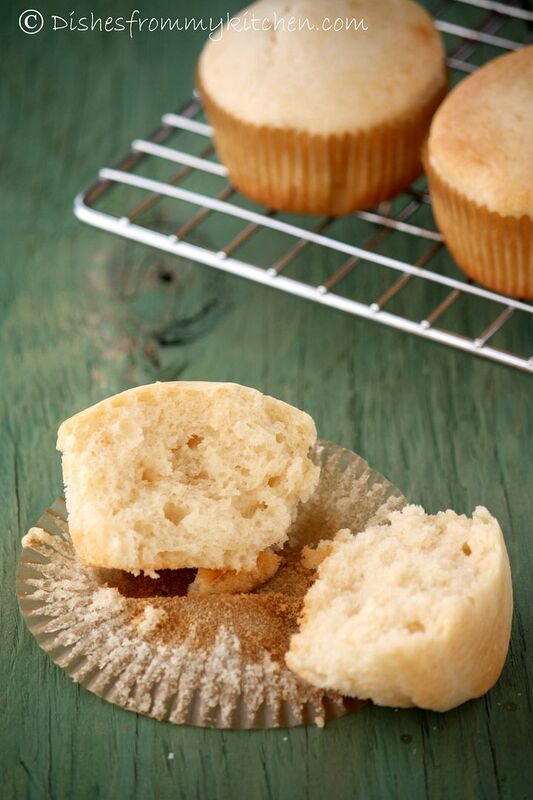 Bake for 15 to 17 minutes, or until a toothpick inserted in the center of the cupcake comes out clean with a few crumbs clinging to it. 7. 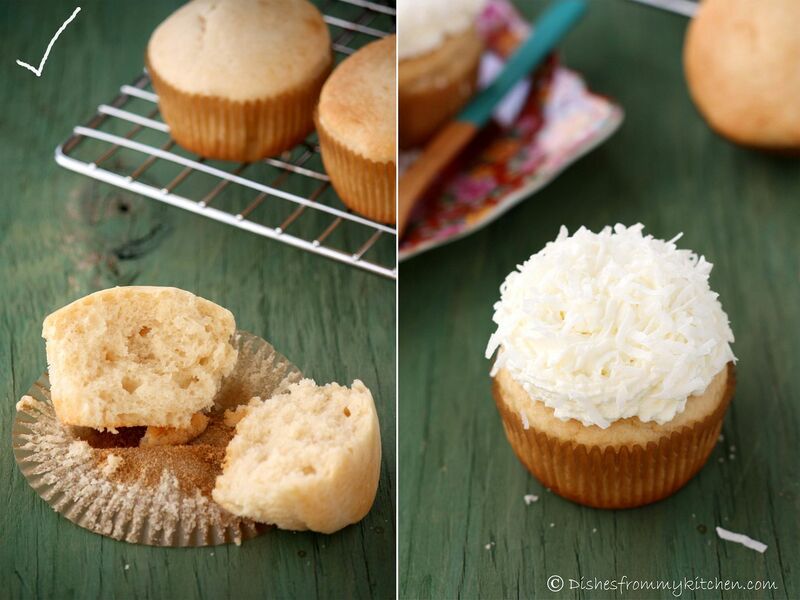 Cool the cupcake completely and frost with your favorite frosting. You can frost the cupcake with your favorite frosting like butter cream, cream cheese or chocolate ganache according to your preference. 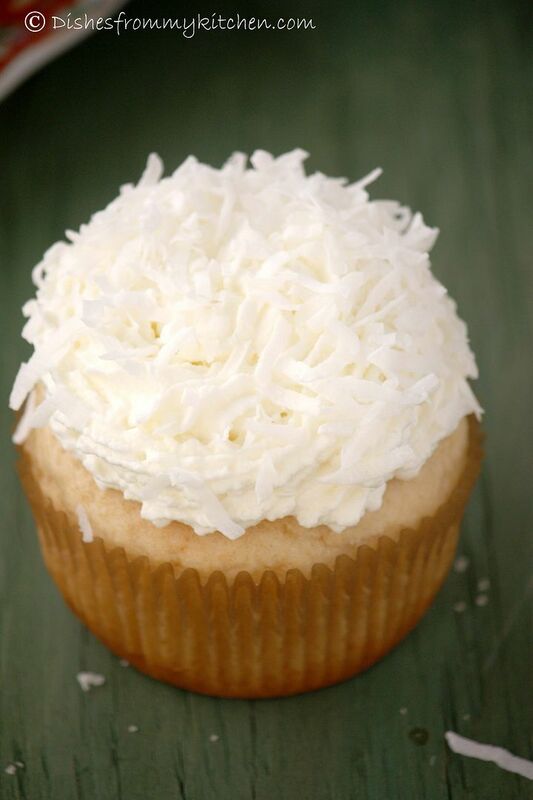 But since I wanted to make the frosting very light, I frosted with whipped cream and dusted with few coconut flakes. 1. You can also use Soy milk, almond milk or coconut milk in the place of milk in the recipe for vegan option. 2. You can also add orange or lemon zest to get the zesty aroma. 3. You can also add tsp of cinnamon to make it cinnamony and frost with chocolate ganache..it taste absolutely divine. 4. You can also add chocolate chips or frozen berries to make it chocolate chip cupcake or berry cupcake !!! Do try and let me know !!!! wow...how nicely done! super clicks! This is lovely Pavi... both the pics and the recipe..
All the hardwork has finally paid off dear..
Keep up the good work... superb..
that does look super moist..i have never tried an eggless cake..
OK, guess what I'm doing this weekend! Making cupcakes, yay! Came here from HBG and got blown away with the fantastic pics! :) Tks for sharing the recipe...will def give it a go! 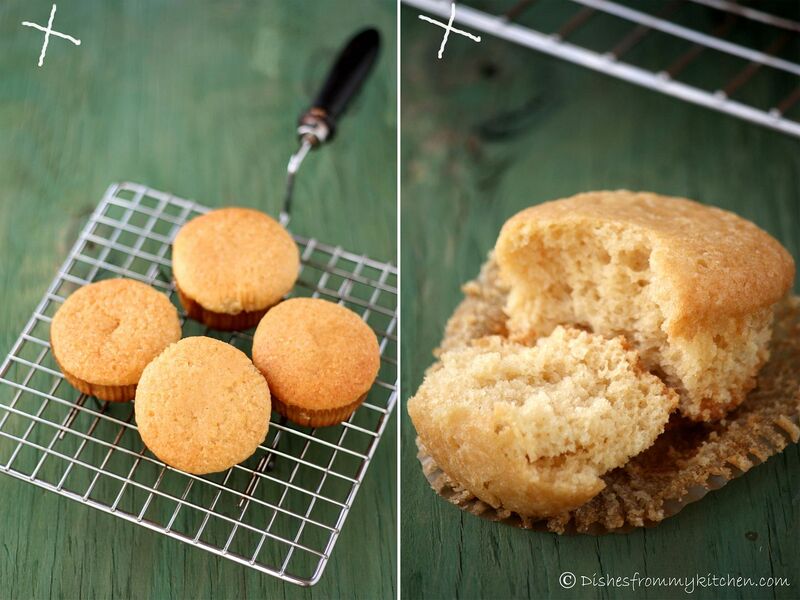 Very attractive, super moist and spongy cupcakes. It's great that you have done the experimenting for us. The dollop of cream on top finishes it all off beautifully. The cup cakes are too cute and got ur version of eggless vanilla cake.b/w can i use corn flour instead of corn starch. Loved the first pic with the sieve. Very beautiful. Cupcakes look so very delicious. Fabulous photographs! Followed your link from HBG. Thank you for the recipe! What a spectacular photograph that first snapshot in this post particularly. Wishing you and your family a Happy New Year! Nice pics pavithra. I wonder how to go about this recipe in cups? how did you measure 60 gms of sugar? with scales? Could you give an alternate in standard cups? 1. For crispy crust - You're either baking them too long or your oven is too hot. Lower oven temp 25ºF. Do you have the oven rack in the middle of the oven and not higher? Keep it in the middle rack. Are you using granulate fine sugar ?? If your sugar is with larger granules, measure it and slightly powder it. So that it dissolves in the batter easily while mixing. 2. 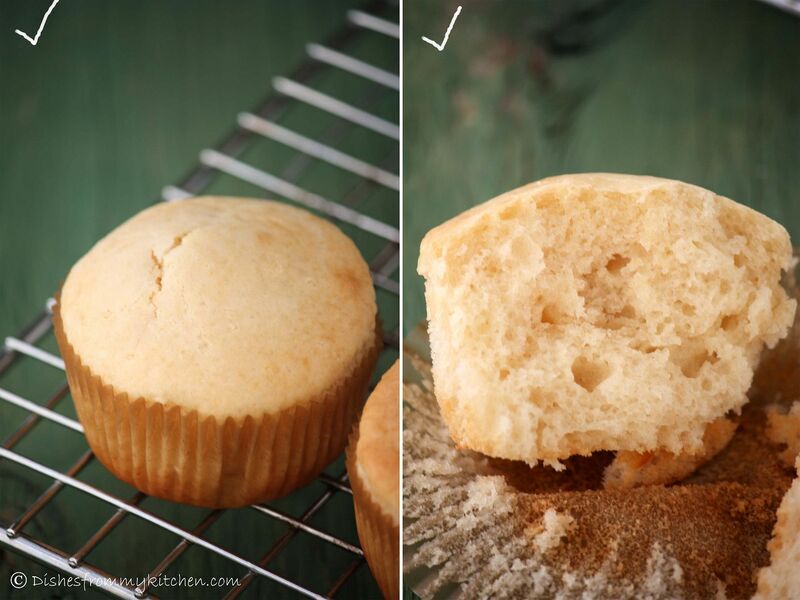 Fill the cupcake liner only upto 2/3 rd of it(this is must) , if you fill more than that it rises with odd shape. 3. Do not mix the batter too long. Hope this helps, Let me know how it came out when you get a chance to try next time. More than cup measurement I prefer in gms for accuracy. I measured in kitchen scale. 60 gms of sugar is about( 1/4 cup + 4 tsp) . Hope this helps. tried ur chocolate cupcake recipe and it came out perfect. planning to try the the vanilla one in cake form. Plz do suggest if I need to make any changes in baking time or any other tip . The cupcakes looks so delicious and moist just like a regular cupcake,and also thanks for sharing the cake flour ingredients. Am planning to try the the vanilla one in cake form.Plz tell about the oven heat & baking time for that vanilla cake. @ Anonymous I am glad you liked the chocolate cupcake. For the Vanilla cake use 7 " or 8 " pan. The baking time would be 30 - 35 minutes. As each oven varies.. keep an eye when you near 25 minutes or 30 minutes when you make it first time. Hope this helps. I did not read anything this time. I was looking at the images and was attracted towards them, browsed up and down many times to enjoy them. A nicely written post and well captured images, I must appreciate you for it. Have a nice weekend Pavithra. Tempting recipe.. I tried the Eggless Vanilla cupcakes. They came out good. The texture was also good. But while eating, there was little smell of oil. Any suggestions for that? 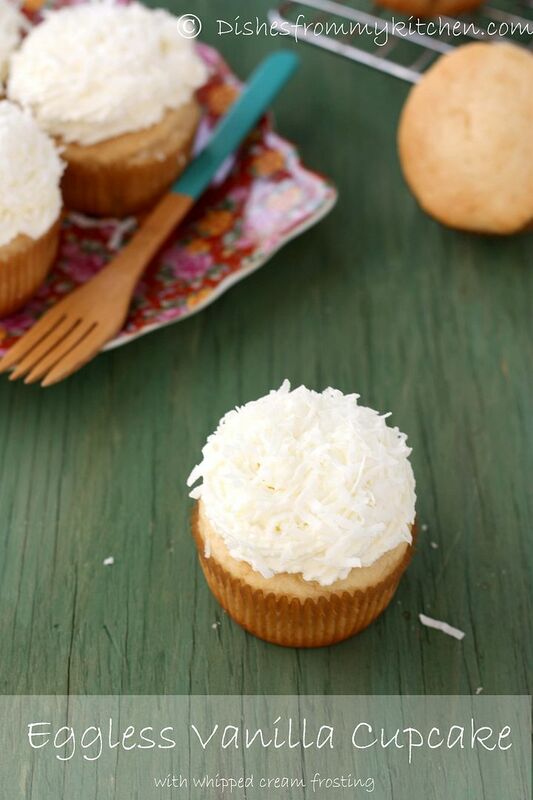 What type of sugar do we use in making the eggless vanilla cupcakes ? @ Neha - Neha, glad you liked it :) What oil did you use ??? Use oil canola or sunflower oil... And use correct amt of leavening agent, it should be fine. @ Tejal - Its fine granulated sugar. Hi, can you use self-raising flour instead of the cake flour? Hi, I made this recipe (doubled) as a cake last week for my son to share at our daycare centre (we need to have egg-free baking to accommodate children with allergies). It came out perfectly and everyone loved it. Thanks for the recipe! Awesome. Am trying this tomorrow. will let you know :)thanks for sharing! Hi! Your recipe looks great! I want to try it out for sure! Could you please give us the cup measurements for the vanilla cupcakes? Is it ok to use readymade cake flour? using this recipe, my aqua ombre cake turn out wonderfully, thank you! Also, after baking the cake i sprayed it with a sugar-water mix to help keep it moist. I do not know where I went wrong.. My batter was like that of a dough.. I used 120 gms flour, 60 gms sugar, milk 1/2 cup and the other ingredients as suggested.. but the consistency was not right.. what would have gone wrong.. pls help..I used the standard measuring cups for the wet ingredients.. These are the best cakes I have baked so far.. its flawless.. and comes out best! @ Asha! Pavithra would be the best to comment.. but in my limited baking knowledge, you could add a little more milk, the thumb rule in baking a cake is the batter should be of dropping consistency, if you drop the batter from a spoon it should fall effortlessly! Hope this helps! Used a 4 oz cup of strawberry yogurt instead of the milk. Turned out wonderful! Now I plan to make with other flavors. Thank you! wow.. beautiful,mouthwateringcupcakes and ur clicks are amazing . I am going to try this recipe this week. Hi can you please tell me what is the measurement of cake flour and sugar in terms of cups? Thanks. can i add lemon jiuce in the place of vinegar? This really was a fantastic recipe.. The cupcakes came out fabulous. I increased the recipe to 60 cupcakes for my sons school event and had no problems. Best yet is that the recipe is very economical without butter and eggs at that quantity. Thanks for sharing! Hi. Did you remove your chocolate cupcake recipe???????????????????? I've just made your recipe and it looks great. Can I double and triple the recipe, if I want to make more, or do I proceed with separate bowls? Since I'm using baking soda and vinegar I know I have to proceed fast for baking. Thanks for your response. Hey! I'm making a cake for my cousins first birthday and I don't have a scale at home! So I was wondering if you could tell me how much 120gm of your cake flour would be in cups. I would really appreciate it! Thanks. hie..thanks for sharing the recipe .. i made the cupcakes but had an issue..
i used the cake flour is uve mentioned.. sieved it four times to incorporate air too..
Hi. Have tried both your vanilla n chocolate cupcakes. They r simply delicious n moist. I want to try fresh strawberry cupcakes tht too eggless. Cud u plz help here. Thanks n looking fwd to. Tried this, It was super moist!! One observation- I felt the oil added was bit excess. my cupcake liners were ozzing out oil after the cupcakes were done. Also I thinkni should add powdered sugar instead of granulated sugar. I need to do this for an event. How many days ahead can i do it and store. How to store. Can the frosting be done earlier too. I rarely comment on blogs but have to say thank you for this brilliant recipe- I needed a few egg-free cupcakes for my son's party and made another recipe earlier in the day which completely (literally) flopped. I gave these a try and watched in amazement through the oven door as they rose perfectly, evenly- they are moist and light and tasty. Thanks for a winner recipe! WISH YOU ALL HAPPY AND SAFE DIWALI !!! JALAPENO TOFU - MOUTHWATERING APPETIZER ! BROCCOLI STIR FRY WITH HINT OF SAUNF !